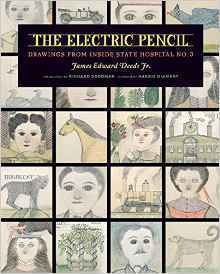 Richard wrote the introduction to this book about the outsider artist, Edward Deeds. Richard Goodman is the author of French Dirt: The Story of a Garden in the South of France. His other books are The Soul of Creative Writing, A New York Memoir and The Bicycle Diaries: One New Yorker's Journey Through 9-11. He has written for The New York Times, Harvard Review, Creative Nonfiction, Vanity Fair, Ascent and the Michigan Quarterly Review. Richard is a founding member of the New York Writers Workshop. He is Associate Professor of English at the University of New Orleans. "I possess a deep prejudice against anything written by Anglo-Saxons about their lives in or near French villages. So, Richard, I thank you for breaking the spell. I like very much what you wrote." "Goodman borrows a plot of land on which to grow a garden, a project that his neighbors view first with curiosity, then with sympathy and a deepening sense of involvement. There's a genuine sweetness about the way the cucumbers and tomatoes bridge the divide of nationality." "One can learn much from this man who feels tender toward cobblestones and old women, nostalgic about a daughter's childhood, frightened at the prospect of dying alone—a rare individual who, with honesty, sensuousness, and keen observation, turns yearning and remembrance into art." "Richard Goodman’s marvelous book, The Soul of Creative Writing, will instruct, delight, edify, challenge, reassure, and guide any student of writing to a personal best." "Richard Goodman is one of the most generous and astute literary guides I've read. This book is a gift to writers." "This book is not just for writers then, but for lovers of words and writing. For renewing my excitement about what I've chosen to do for a living, this book deserves thirteen exclamation marks". "Elegy for an English Bike"